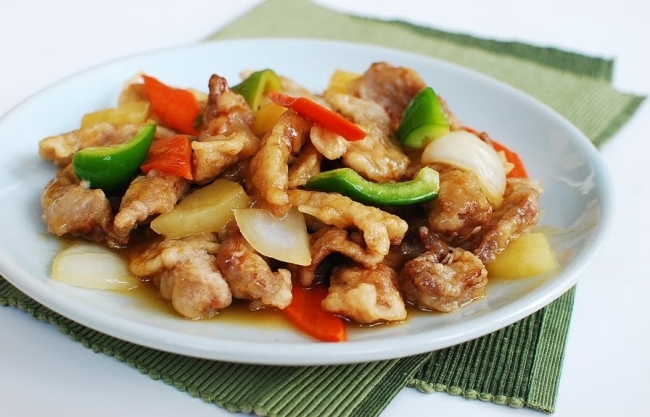 Tangsuyuk is a Chinese sweet and sour pork dish adapted for Korean taste. It can also be made with beef. It is a beloved Korean-Chinese dish that’s often enjoyed along with jajangmyeon (noodles in black bean sauce) or jjambbong (spicy noodle soup). The potato starch used to make the batter is pre-soaked for several hours. This is a traditional method used to create a slightly chewy yet crispy crust. It is important to deep fry the meat twice for extra crispiness. The key to a successful sauce is the balance between sweetness and tartness. This recipe produces a well-balanced sauce, but you can always adjust to your taste. The vegetables add different textures and a colorful touch. It’s easy to make, but the process goes very quickly. So, have all your kitchen equipment and ingredients ready before starting to cook. The result will be crispy, deep-fried goodness in a delightfully sweet and tangy sauce! At least 2-3 hours before cooking this dish, combine 1 cup of the starch with 1 cup of water and refrigerate until ready to use. The starch and water will separate, and you will need to carefully pour out the water on top to use the soaked starch at the bottom. Cut the beef (or pork) into bite-size strips. Lightly sprinkle with salt and pepper. Let it sit until ready to deep fry. In a pan, add 1 cup of water along with the remaining sauce ingredients except the starch slurry. Boil just until the sugar melts. Remove from the heat. You will finish the sauce when the meat has been deep fried. Carefully pour out the soaking water from the starch. Use your hands to mix the soaked starch with the egg white and oil. The starch will be very stiff. The addition of oil will help loosen it a little. Coat the meat with the starch batter. Add oil to a deep fryer or a heavy bottom pan. Heat over high heat to 180°C or until it starts smoking. Using metal tongs or chopsticks, drop the meat in the oil one piece at a time. Fry them in two batches. Overcrowding will drop the oil temperature too quickly. Cook until light golden brown, about 1-1/2 minutes, reheating the oil between the batches. Remove them with a wire skimmer or a slotted spoon. Drain on a wire rack or in a large mesh strainer set on a bowl. Reheat the oil. Deep fry again until golden brown, about a minute. You can do this in one batch for the second frying. Bring the sauce to a boil again. Add the carrot and onion pieces, which take longer to cook. When the sauce boils, add the starch slurry, stirring well. Taste the sauce and add a little more sugar or vinegar if desired. Turn the heat off, and then add the green pepper and pineapple pieces. The green vegetables lose their color quickly if boiled in the sauce. Place the meat on a large serving plate and pour the sauce on top. Serve immediately with a dipping sauce, if desired. For more recipes visit www.koreanbapsang.com.